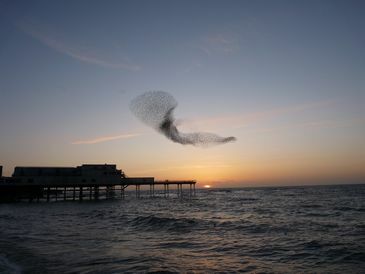 Aber's most spectacular natural phenomenon occurs at dusk in the Autumn & Winter months. 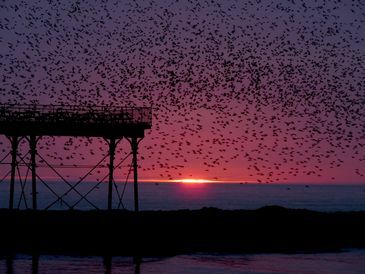 Thousands of starlings will fly in to roost under the pier at night. 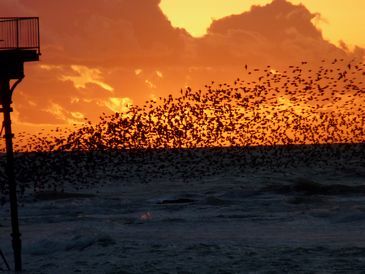 They arrive in separate groups from the surrounding countryside and as the numbers build and they will sometimes engage in a spectacle of synchronised flying before finally settling down for the night. 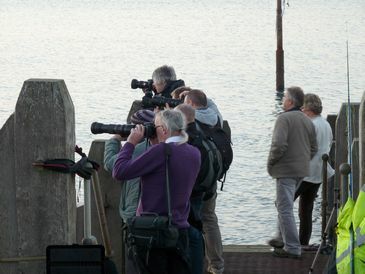 Each dusk as the sky fills with birds, the prom fills with a small, dedicated, hopeful crowd of birdwatchers and photographers with their optical appendages ready to appreciate the coming spectacle. 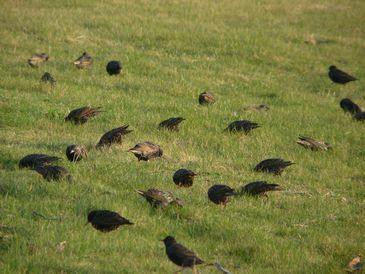 Starlings mostly feed by foraging in pastures/grasslands/fields for grain seed and insects - especially leather jackets (= crane fly larvae). 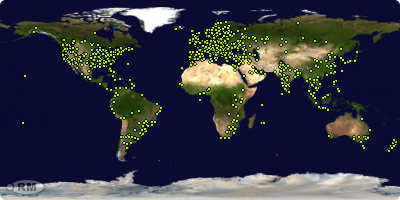 With the onset of winter frosts in Scandinavia and Central Europe the ground becomes too hard for them to feed so they migrate to join the small resident population in the mild West. 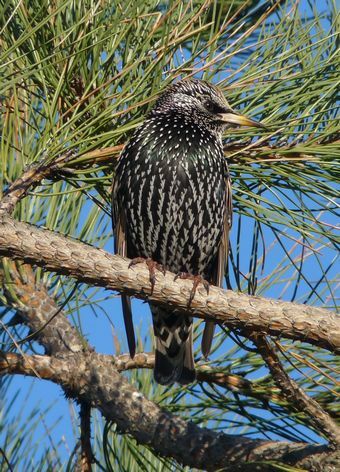 (The resident population has decreased over recent years and now starlings are on the 'Red List' of threatened species.) Instinct and the weather determines exactly when the migration happens but generally, the numbers start to increase from the Autumn Equinox - but could be delayed by a mild Autumn or strong windy storms. Similarly, numbers decrease as the Spring Equinox approaches - but could be delayed by particularly hard or late frosts. Every dawn the birds fly out from the pier in search of new feeding pastures in the surrounding countryside. Every night, as the winter daylight fades into dusk and they can no longer find food or see predators, they seek a safe place to roost. They set off in groups where there are more eyes to notice predators - typically sparrowhawks, peregrine falcons and buzzards. If a predator does attack a group they may become confused by the swarm all around them and fail to isolate a target. To reduce the opportunities for their flying predators the small groups fly fast, low and in near silence. The only sound being the momentary 'whoosh' as a low flying group passes just overhead. 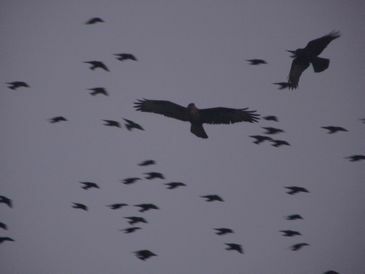 As they get close to their roosting site the groups merge to become larger and larger. 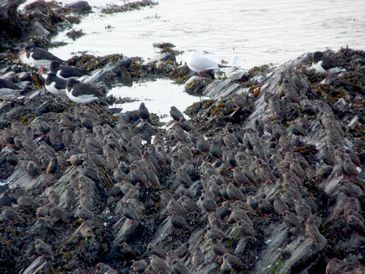 Preferred roosting sites seem to be above water which makes it more difficult for walking, crawling and climbing predators to get at them while they sleep. If available, they will often roost on reeds in wetlands but piers make an acceptable alternative. As autumn passes to winter those reeds dry out and get flattened by storms so the numbers using Aber' pier continues to increase well past the new year. 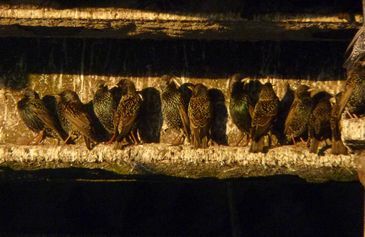 When the starlings arrive at their roosting site they will usually not immediately go down to their perches and it is their behaviour between arriving and going down that most of the crowd have come to see. Having arrived and checked out the situation, some groups are dissatisfied so will head off back inland or North in search for alternative roosting sites. On some days hundreds of the birds that arrive at the pier will promptly leave for another roost. 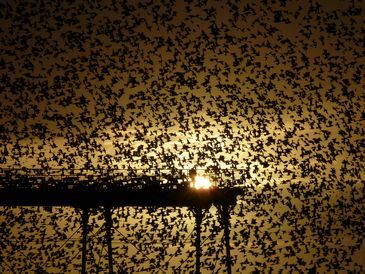 The earliest groups will not go under the pier but often land on a nearby building or tree, rest and wait for the others. 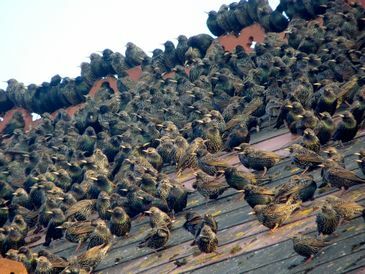 The roof of the old college, church, some houses near the market hall and some trees behind Laura Place will often be full of waiting starlings. Other groups will arrive and fly continuously around the pier being joined by new groups coming in and by the groups that have been resting near by. Even now, some groups will peel off and head to other sites. More often than not, the flying will only be loosely synchronised - from a distance looking like thick smoke swept by a light breeze. 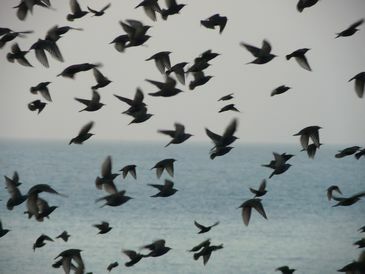 But occasionally, the flying will be tightly, almost impossibly, synchronised and this is what the crowds are hoping to see - braving windchill and the warm splashes of guano rain. This tightly synchronised swarm dance must be very important to the starlings. They dash from their feeding grounds doing their best to avoid predators and once arrived they .... don't dive to the safety of the roost. Instead, they engage in this reckless spectacle with the only concession to stealth being the fading light and their silence. 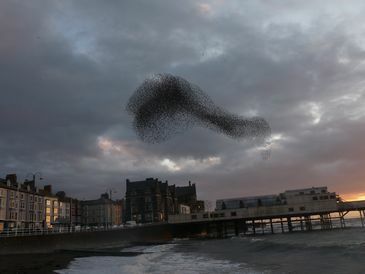 The starlings seem indifferent to all the gulls and crows around the prom, but sometimes a bird of pray will cut though them causing a momentary flinch of the swarm ball but there is so much movement that the attack is usually unsuccessful. Even when the predator makes several passes through the swarm the dance continues. Around mid winter, when twilight is short and food is scarce, the swarm dance will be quick or even non existent. Towards the end of October / beginning of November it can be half an hour and late winter/early spring it can even be an hour long. 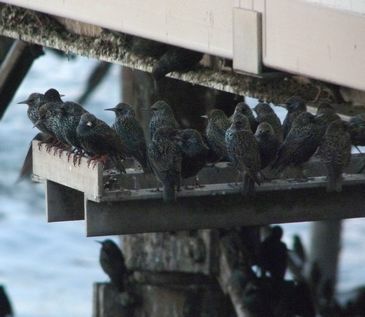 The roost under Aber pier is close to the crowds on the prom and sometimes there are even, guano indifferent, people watching the spectacle from the pier end which is much closer than a starling is comfortable being to human so that is probably a compounding factor in their behaviour. When the moment it right, the birds break from circling and dive down under the pier to their perches - almost as through they were playing a silent version of 'musical chairs'. Until now the whole spectacle has been in silence with the only gulls and crows to be heard. 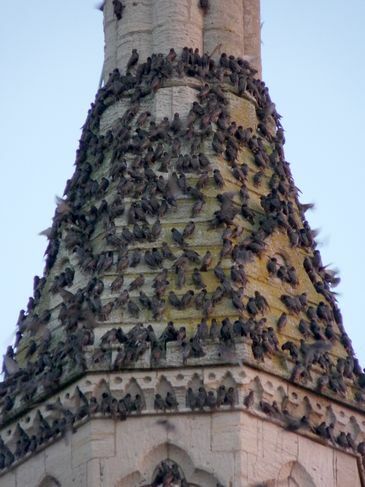 But once the starlings reach their perches they break their silence and erupt in chatter, revealing just how apt the collective noun 'chattering' is for starlings. A particular advantage to seeing this in Aberystwyth is that the backdrop is the setting sun over the sea. A particular disadvantage to seeing this in Aberyswyth is that there is very little shelter and 1st timers are soon thwarted by the prevailing windchill. Regular spectators come with hats and many layers of clothing. The Royal Society of Biology are trying understand this phenomenon better so are running a nation wide citizen science survey - every time you see one let them know. 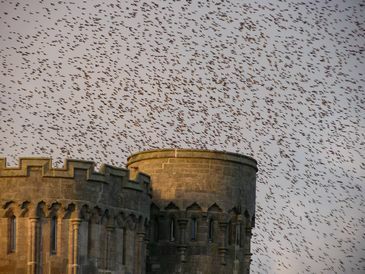 The 2014 murmuration map shows hundreds of others sites around the UK.